These are not your ordinary ground turkey burger sliders. If you’ve had one that needed to be loaded down with cheese, onion and condiments to mask the bland flavor, then you are in for a pleasant surprise. The secret ingredient is mango chutney. For the sake of the picture, I used a bun. I also slathered a dollop of mango chutney and a few green onions on top of the patty. Meanwhile, my photography assistant (aka darling daughter #2) and the Chief Grilling Officer (aka my hubby) were gobbling down these ground turkey burger sliders au naturale. No bun necessary. Nope. Just add a salad and enjoy! Read on to see just how we made them. Or, skip down to the bottom for the super easy recipe. 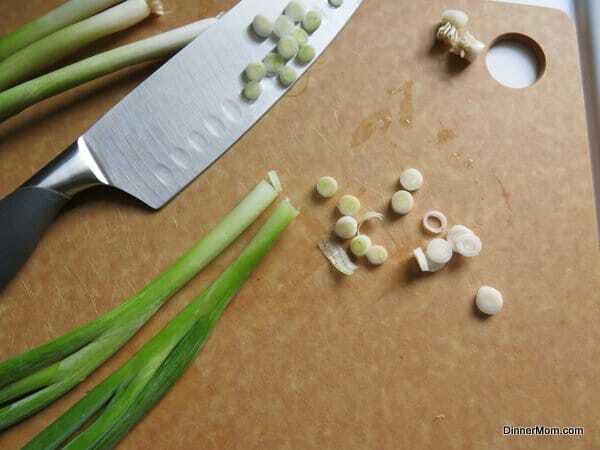 Thinly slice about 2-3 green onions. 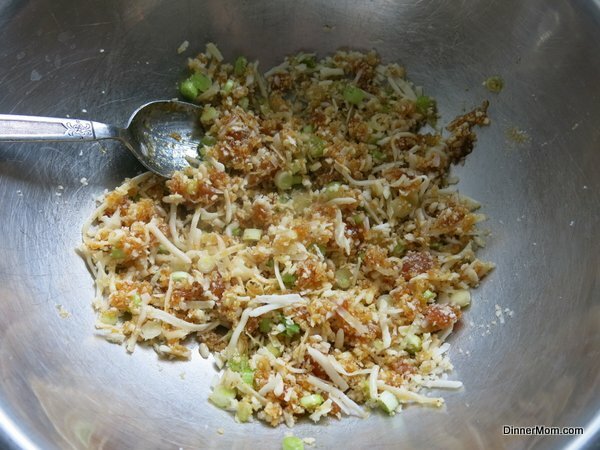 Add the green onion to a large bowl along with the other ingredients: Panko breadcrumbs, mozzarella cheese (we used a vegan substitute,) salt, pepper and prepared mango chutney. Combine these ingredients before adding the ground turkey. It seems like a minor thing. But if you don’t mix up these ingredients first, then the base does not get evenly mixed throughout the turkey and you have to handle the turkey a lot more than necessary, which makes for a tough turkey burger. Don’t you just love the blue gloves? They are a holdover from my days at the meal preparation store. You can buy them just about anywhere and you will never have to touch raw meat again! For sliders, shape the meat into 1/4 cup sized patties. You will end up with about 12 sliders. You can also shape the meat into regular-sized burgers. Sliders just seem to add a little pizazz to dinner at our house. He would like you to know that these little sliders only take about 2 minutes to cook on each side over medium heat on a grill. The meat should not be pink in the middle. Larger patties will take a few minutes longer. They can be pan-fried for about 2 minutes on each side over medium heat. And, they also cook nicely on a George Foreman grill. (Yes…we do have a lot of appliances around here!) Total cook time is only about 2 minutes and there is absolutely no grease (and no mess) if you use ground turkey breast. These are some of the tastiest ground turkey burger sliders you’ll ever try. I’d place a bet on it! 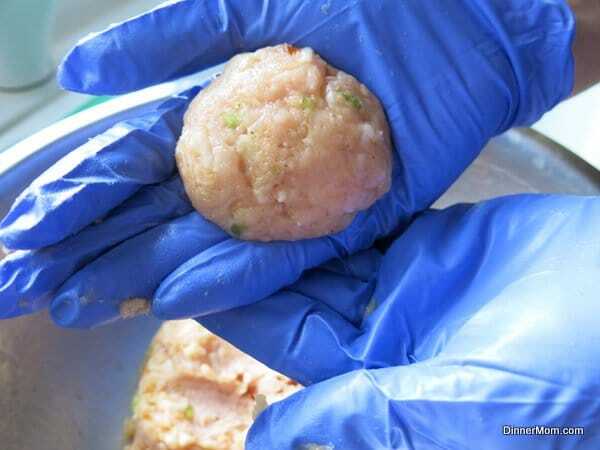 Make it ahead of time and freeze it – Shape the patties into the desired size. Freeze them in a covered and tightly wrapped tin. You can also transfer them to a plastic bag that seals when they are frozen solid. Defrost completely before cooking. Cooked burgers can also be stored in the freezer and microwaved when you are ready to eat. Make it free from dairy and soy – Use a mozzarella flavored shred free of these allergens. We did! Keep it healthy – Make sure to use ground turkey breast, whole wheat Panko breadcrumbs and low-fat mozzarella cheese. Choose your condiments wisely and pick a healthy, whole grain bun too! 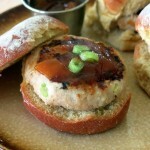 Ground turkey burger sliders laced with mango chutney are so delicious you won't even need a bun! Easy recipe that can be made ahead and frozen. Add the first 6 ingredients to a large bowl and mix well. 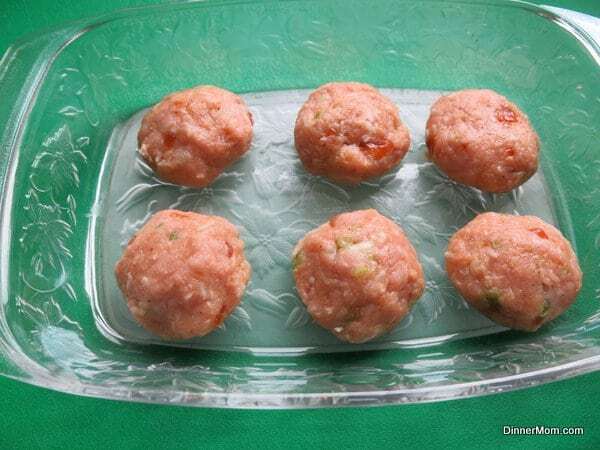 Add the ground turkey to the bowl and fold in the other ingredients so that they are evenly distributed throughout the meat. Don't overmix or the meat will be tough when cooked. Shape patties into desired size. Sliders will be about 1/4 cup of meat. Grill over medium heat (or pan fry) for about 2 minutes on each side. Serve in a bun or over salad greens. These can be made ahead of time and freeze well. Another option is to cook the burgers and freeze leftovers for a quick microwaved meal.